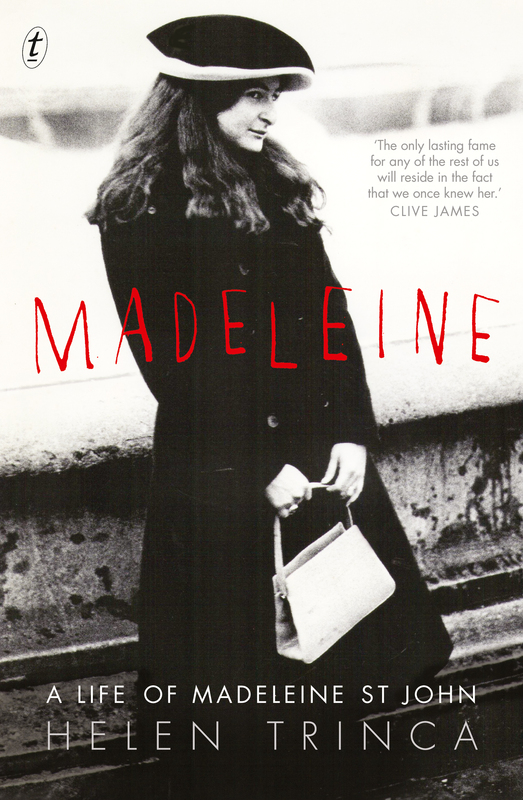 I wanted to read Helen Trinca’s biography Madeleine for several reasons. First, of course, being a reader, I’m interested in biographies and autobiographies of writers. Secondly, Madeleine St John belongs to that group of Australians, half a generation or so older than I am, that has made quite a mark on the literary and arts world. Her friends and acquaintances included Sydney University peers Clive James, Bruce Beresford, Robert Hughes, Richard Walsh, most of whom lived ex-pat lives like she did. Thirdly, her father Edward St John, was a controversial conservative politician (and then barrister) who fought injustice and whom Justice Michael Kirby described as “a contradictory, restless, reforming spirit”. And finally, I was hoping to find out more about what happened to Bruce Beresford’s plan to film her first novel, The women in black. Trinca covers all these bases and more in her biography. I somehow feel (not for quite the first time) that life is beyond my capacities … meanwhile am trying to write some fiction, which is abominably difficult & and therefore terrific – but horrifying. This quote says a lot about St John – about how hard she found life, and about the heightened way she lived it. … and making her, I think, a tricky subject to write about. Madeleine was, and there is documentation from a variety of sources to support this, a controlling and emotionally erratic friend who would, as one said, “just destroy everything, destroy a relationship”. She was, as we’d say now, high maintenance, and wanted, needed, to call the shots. And yet, people stuck with her, because she was witty, intelligent company, and also because people saw her need. Trinca handles this minefield with a clear, even-handed but sensitive eye, enabling us to feel Madeleine’s pain while being frustrated at her inability to lift herself out of it. St John moved to London in the 1960s, leaving, more or less by mutual agreement, her first and only husband behind in the USA, and eventually took out English citizenship. She was horrified when, on being shortlisted for the Booker Prize in 1997 for her novel The essence of the thing, she was hailed as an Australian writer. She didn’t want to be aligned with the place, but she was the first Australian woman to be shortlisted for the Booker, so no wonder she was hailed that way. Trinca’s biography is a traditional, chronologically told one. It’s tight, with little superfluous detail but enough examples to provide a good picture of Madeleine and her life. I particularly enjoyed the chapters covering the writing and publication of her novels. The book is very well documented, using clear but unobtrusive numbers linked to extensive notes at the end. In her acknowledgements, Trinca details what records she had available and where the gaps are. In addition to the oral history St John recorded (covering the first couple of decades of her life), Trinca had access to letters by and to Madeleine (though many were destroyed) and other documentation such as wills, and obituaries written by those who knew her. Trinca also interviewed many of the significant people in her life. I was intrigued to discover names familiar to me in other contexts, such as filmmaker Martha Ansara. The older we get, it seems, the more we discover our paths have crossed in interesting ways with others. A slight exaggeration perhaps, given who the “us” are, but James clearly believed that this complex late bloomer who produced four novels in six years deserved more recognition than she was getting. Thanks to Text Publishing, all four of her novels are back in print and we have this thorough and highly readable biography. All we need now is to see The women in black in film! Interesting! Have not heard of this writer and would be curious to hear what you make of her novels. Sounds as though she belonged to that first wave of exiles who suffered the ‘cringe’. I’d like to hear more! I think you’d really like her Catherine … She did suffer from the cringe but it was exacerbated by her hatred of her father and step-mother. I’ve reviewed The women in black … You can find it via my Author Index if you’re interested. I have her second novel on my TBR. I think Lisa made an excellent comparison. There’s a biting restlessness in St John’s Books. I can imagine her writing Spark’s novels but not Austen’s. Thanks Guy. I’ve just read The women in black, but have her second novel here ready to go. I’ve read the Jane Austen reference but didn’t really get a clear sense from the novel I read. I’ve also heard the Muriel Spark reference too. AS Byatt makes a reference to Kafka … Re the Booker short listed novel. That intrigues me! I haven’t read your review yet, Sue, just zapped over here to grab the URL so that I remember to link to it when I get round to writing mine. This bio is next on my NF TBR, but right now I’m reading Janet Butler’s Kitty’s War about the experience of WW1 nurses, what a contrast that will be, eh? I look forward to your review Lisa …. It’s an intriguing story about a complicated woman. She would have been interesting to know. And yes, I expect it will be very different to what you are reading now. Your review comes shortly after I read The Women in Black. I wouldn’t have guessed she was such a complex character after reading her novel. Thanks Emma … No, I don’t think it’s obvious there, either. I think she enjoyed writing fiction. There are elements of the challenges women face, of having to make your own decisions, in The women in black but that novel is more positive than her life would suggest she might be I think. Also, “the heightened way she lived [life]”. I think I understand that, in a way. The intensity of ups and downs and throwing yourself into them utterly. I think you would understand that … but you treat your friends way better! I think you’d find her interesting Stefanie … And she’s a quick read. I believe it’s money … I have met Bruce B and I know a good friend of his. I believe they remain in good contact. I mentioned it to this friend again the other day and he said money! I find that a shame because it looks to me like a film that would be a goer, and Beresford certainly has a good track record. I can imagine several Australian actors enjoying playing the roles. A new name to me, I am ashamed to say. Evidently a remarkable person – like so many writers, not the easiest of people to get along with. She “never saw things from any other perspective but her own”? Hard to understand that someone with that trait could ever become a good writer of fiction! That’s a good point, Tom. Perhaps she was one of those people who can do it in theory but not in practice … she’d be horrified to think we Aussies knew her but not you Brits. She was distressed when at the Booker nomination they starting hailing her as an Aussie! She had a love hate relationship with her birth country it seems. Yes, I have to change some of my tags. I need to differentiate between British fiction and Scottish fiction because many Scots think of themselves as living in a separate country. Funny thing this nationalism. I seem to be devoid of patriotic feeling – obviously a serious deficiency. Oh dear … I gathered that that was still an issue in some quarters. Nationalism is a scary thing … It’s one thing to love your country but to hate others, to foster hatred or the inferiority of others is a scary thing.